Valletta moved back on top the BOV Premier League table as they scored four goals in the second half to beat St. Andrews at the National Stadium on Sunday. The Citizens move two points ahead of Hibernians, who, however, have a game in hand. Led by Gilbert Agius as their new coach following the resignation of Danilo Doncic earlier this week, Valletta failed to impress during the first half but a goal early in the second half paved the way for a comfortable win. For St. Andrews, this was the seventh consecutive defeat. They remain third from bottom on 18 points, four behind Senglea Athletic, who have a game in hand. 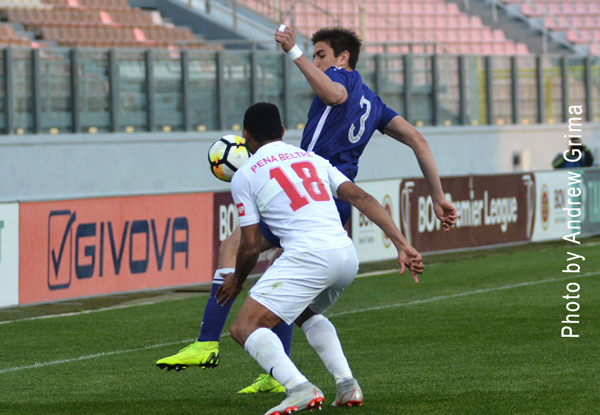 Valletta managed to break the deadlock one minute in the second half when Mario Fontanella slightly deflected a long-distance shot by Steve Borg, past goalkeeper Calleja Cremona. The Citizens doubled the score on the 68th minute thanks to Kyrian Nwoko who headed the ball home following a cross from the right by Pena Beltre. Bogdan Gavrila which hit the upright and bounced onto the goalkeeper and into the net. Nine minutes from time, St. Andrews were reduced to ten men after Ricardo Martin received a second yellow card by referee Glenn Tonna. Valletta took full advantage and added another on the 8rd when off a cross from the right by Gavrila, Fontanella headed the ball down for Santiago Malano who slotted the ball home from close range despite Adrian Borg’s attempt to clear off the goal line with Calleja Cremona pushing the ball into the net. ST. ANDREWS Matthew Calleja Cremona, Alex Satariano, Kevyn Mcfarlane (67′ Kemar Reid, Ricardo Martin, Aidan Friggieri (87′ Adam Magri Overend), Joseph Farrugia, Kurt Magro Adrian Borg, Jacob Walker (67′ Luke Sciberras), Martin Davis, Dejan Debono. Subs not used: Elmaddin Mammadov, Malik O’Shea Stewart, Jordan Kelly, Matthew Woo Ling. VALLETTA Henry Bonello, Jonathan Caruana, Steve Borg, Ryan Camilleri (71′ Bogdan Gavrila), Santiago Malano, Kyrian Nwoko (78′ Nicholas Pulis), Enmy Pena Beltre, Joseph Zerafa (68′ Jean Borg), Rowen Muscat, Miguel Angel Alba, Mario Fontanella. Subs not used: Yenz Cini, Antonio Monticelli, Shaun Dimech, Jeremy Micallef.